For those of you who want to add the little accessories onto your bears in order to make them either a Bertie or a Beatrix, here they are! 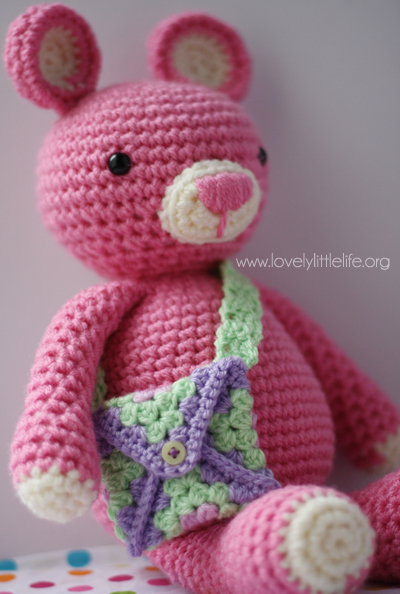 Find the free Bertie & Beatrix Bear pattern here! R96) Turn, ch4, slip stitch in the 3rd chain from hook, ss into the last stitch. Fasten off. There you have it. 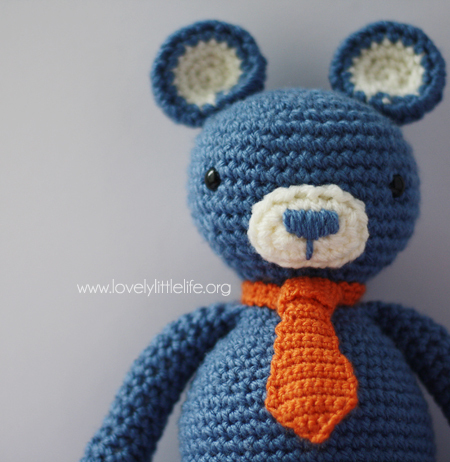 One complete miniature tie for a Bertie Bear! Ok, truthfully this is more of a method than a true pattern! Fold 3 corners of the square into the centre, creating an open envelope shape. 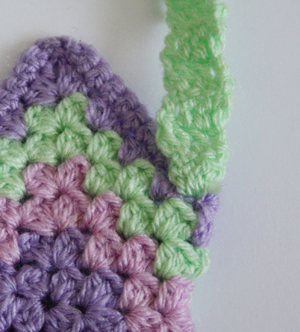 Join the two seams together using double crochet, continuing in one fluid row outlining the open flap as you go. See arrows below as a guide! The strap is simply crocheted onto the back, starting around the post of one of the treble stitches on the rear corner of the bag. R1) ch3, and work 3 trebles. R2-24) Turn, ch3 and make a treble into each treble from previous round. R25) Slip stitch across the strap, around the post of a treble on the opposite corner of the bag to attach. Fasten Off. 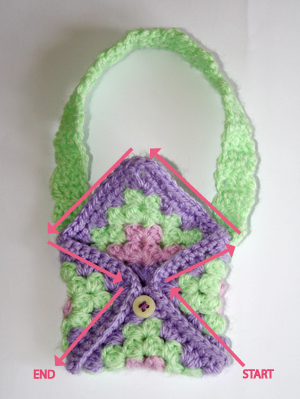 Alternatively, you can just crochet a simple strap separately and stitch it on to the bag! I realise this has been a very brief walk through what I did! I hope it is clear enough, I have been struggling to find the time to write this up! If there any problems or anything that is just not explained enough please let me know and I will do my best to help! 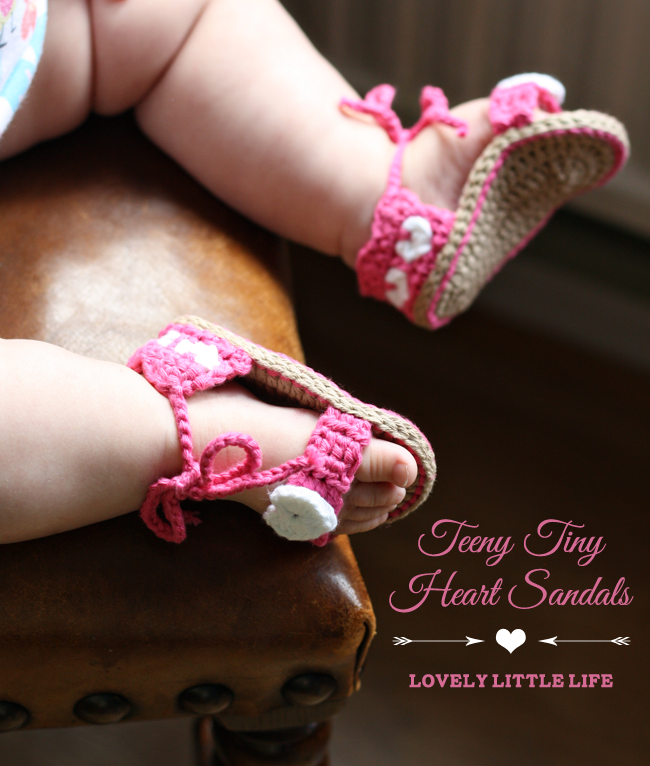 I have a new crochet pattern for baby sandals!!! 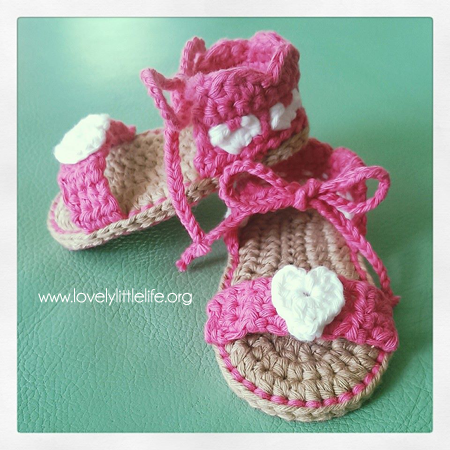 You might know my Flower Power Sandals pattern, this started as a simple variation of that…. and ended as a complete redesign! These sandals are, I think, a great improvement, they are double soled for sturdiness, a better fit, less stitching together is required and I am actively working on the patterns for multiple sizes. I will be working on a photo tutorial but as I’m sure you appreciate that is a lot of work and I have yet to find the time! But it is coming soon! Edit: This is a long post already with just one size written out (I don’t know why I started with 6-9 months?!) but I am going to leave it as is and put the other sizes into a single PDF download. I think it will be clearer, and it will have the bonuses of being available offline and easily printable. Keep a look out at the weekend!!! Edit 26/5/15: I have recently had lots of requests for the pdf file and different sizes for this pattern… I am SO sorry! This is not currently available which is why it cannot be found at this time. It is my intention to put them up but it still requires some work and I have a new baby and other responsibilities that must currently come first. My sincere apologies for any disappointment! 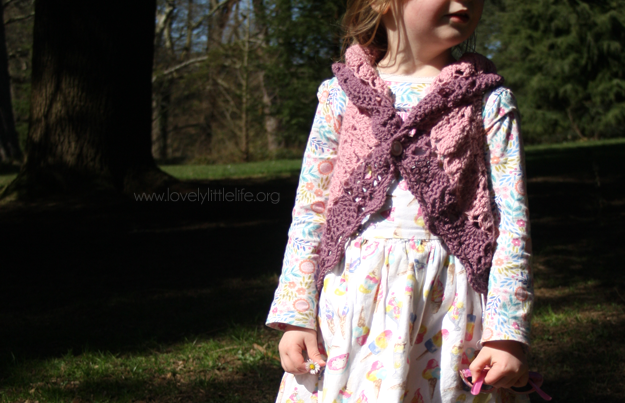 As usual, this is a FREE pattern, please do not sell or reproduce this pattern elsewhere. You are welcome to sell items you make from my patterns but please give design credit and when relevant please link back here. Also, please do not use any of my photos without my express permission and giving appropriate credit. Thank you! I’m using UK terminology, these are the stitches and abbreviations being used. This pattern makes one sandal beginning to end, work through twice for the pair! Using a 3.5mm hook chain 15. R1) Work 3dc in 2nd ch from hook, dc in the next 6 ch, htr in the next ch, tr in the next 5 ch, 7tr in the last ch. Working along the opposite side, tr in the next 5ch, htr in the next ch, dc in the next 6 ch. DO NOT FASTEN OFF. If it is helpful to you place a marker in the last st and move up each round. R2) Beginning in the top of the first st of the previous round. 2dc in the next 3 sts, htr in the next 13 sts, 2htr in the next 5 sts, htr in the next 13 sts. R3) Beginning in the top of the first st of the previous round. [htr in the next st, 2htr in the next st] 3 times, htr in the next 13 sts, [htr in next st, 2htr in next st] 5 times, htr in the next 13 sts. Slip stitch in to the next st and fasten off. Place the two soles wrong sides together. Starting at the centre stitch of the heel end slip stitch the soles together. Turn the sole so that the back loop (not the ‘v’) of the slip stitches is facing you, these single loops are what we will be stitching in to. R1) Find the centre of the heel which should be between to sl sts, count along 9 sts to the right, this is your starting point. Using a 3.5mm hook, join your yarn and ch2 (these chs do NOT count as a st), starting in the same st, htr in each of teh next 18 sts. R2) Turn your work, ch3 (DOES count as a st), temporarily drop this yarn but DO NOT fasten off, skip a st and join a new colour, [ch2, tr, ch1, tr, htr] in the next st, *skip 3 sts, in the next st [htr, tr, ch1, tr, htr]* repeat ** twice more, fasten this colour off. These are your heart clusters. R3) Pick up your original yarn, *sl st into the back loop of the first st of the heart cluster, dc into the ch space, sl st into the back loop of the 3rd heart st, tr into the 2nd sk st of previous round* repeat twice more, then sl st into the back loop of the first st of the heart cluster, dc into the ch space, sl st into the back loop of the 3rd heart st, tr into the last sk st.
R4) Turn your work, ch1 (do NOT count as a st), dc in each st across. R5) Turn your work, ch1, *htr in the next st, htr2tog starting in the same st, htr in the finishing st of the htr2tog, sl st in the next st, sl st in the next st*, repeat ** to the end, finishing with only one sl st, fasten off. Using a 2.5mm hook, ch 40, sl st to the first st on the top left side of the heel, sl st in the next st, fasten off. Repeat attaching to the right hand side. The toe strap is crocheted into the same sl st back loops as the heel. Starting on the right hand side of the sandal as it faces you, count along 9 sts, this is your starting point. R2-9) Turn work, ch2 (do NOT count as a st) htr across. R10) sl st into the opposite side of the sole, starting in the 7th st down from the heel. (You should be crocheting towards the toe end.) Fasten off. Using a 3mm hook, make a magic circle, into it ch2, 5 htr, ch1, tr, ch1, 5 htr, ch2, sl st. 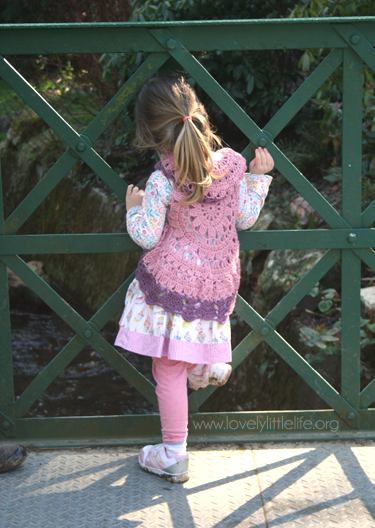 Pull the circle to a tight close and fasten off leaving long tail ends. Using the tail ends stitch the heart to the centre of the toe strap. Hopefully you have a pair of sandals that look something like these! Please feel free to leave me a comment if you have any questions, or just to say hi!